Once you have bought a 3D printer and have moved on to start printing, you need to know what material you want to work with. Different materials have different characteristics and are suited to certain parts. It is therefore important that you know about plastics used in 3D printing. Plastics are the most common 3D printing material. 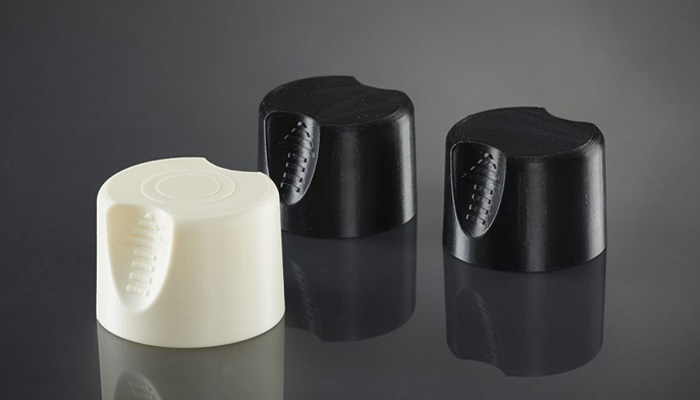 This article will explain the difference between each of these plastics, which materials are used with each 3D printing technology such as FDM, SLA and SLS, and more. There are additional guides on our site for other materials such as metals, organic materials, and more. 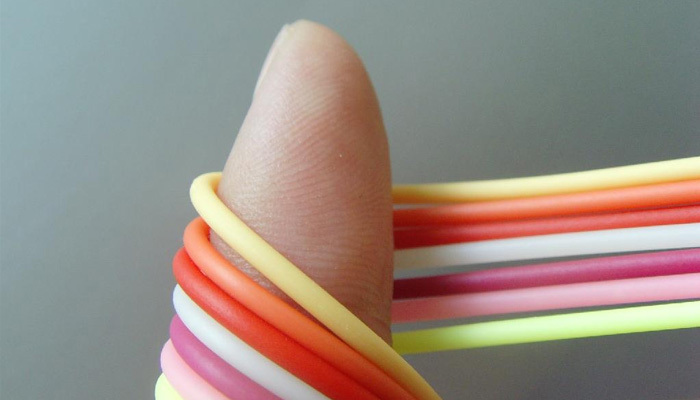 3D printable plastics come in a variety of materials and colors. Fused deposition modeling technologies are the best known for using plastic materials in 3D printing. They are in the form of a filament spool to be placed in or on the 3D printer. With FDM / FFF technologies there are many varieties of plastics and different characteristics for each of your projects. We will explain them all below. 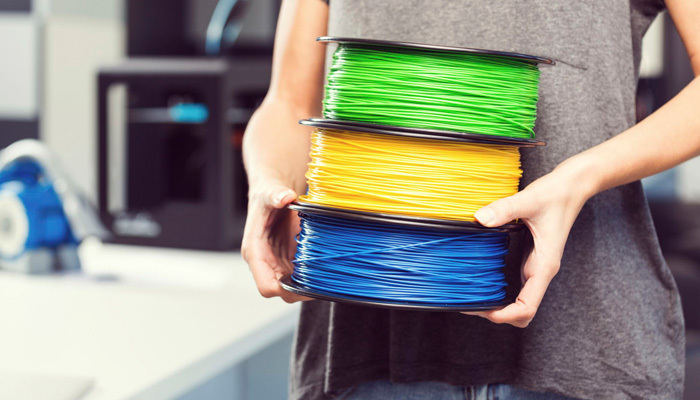 ABS filament is the most commonly used 3D printing plastic, and is used in the bodywork of cars, appliances, and mobile phone cases. It is a thermoplastic and contains a base of elastomers based on polybutadiene that makes it more flexbile, and resistant to shocks. ABS is used in 3D printing when heated to between 230ºC and 260ºC. It is a tough material, able to easily withstand temperatures of -20ºC to 80ºC. In addition to its high strength, it is a reusable material and can be welded with chemical processes. However, ABS is not biodegradable and shrinks in contact with air, so the printing platform must be heated to prevent warping. Moreover, it is recommended to use a closed chamber 3D printer to limit particle emissions when printing with ABS. 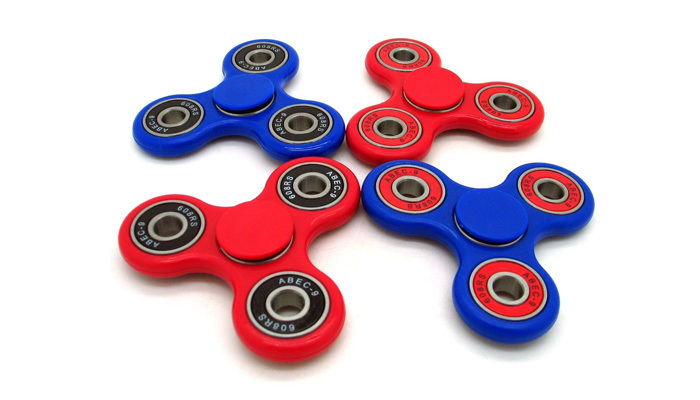 Fidget spinners made out of ABS. ABS is mainly used in fused deposition modeling technologies, the most affordable and accessible 3D printing technology. There is however also a liquid form of ABS which is sometimes used in stereolithography and PolyJet processes. PLA is a more difficult material to manipulate due to its high cooling and solidification speed. It is also important to mention that models can deteriorate when in contact with water. However, the material is consistent, simple to use, and comes in a wide variety of colors, making it suitable for FDM 3D printing. 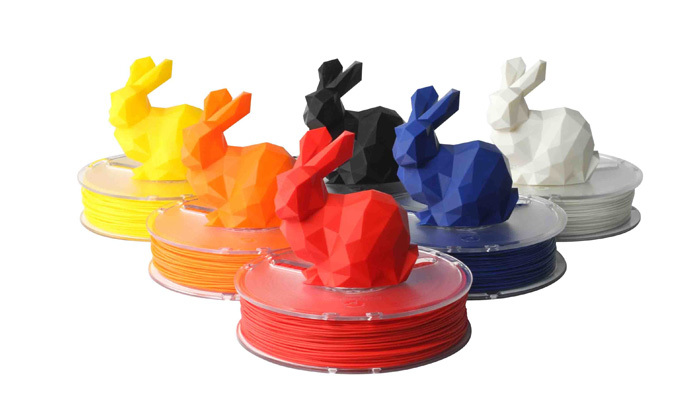 PLA offers a variety of color options. ASA is a material that has similar properties to ABS, but has a greater resistance to UV rays. As with ABS, it is advised to print the material with a heated bed platform to prevent warping. When printing with ASA, similar print settings are used to ABS, but extra care must be taken to print with a closed chamber due to styrene emissions. Polyethylene terephthalate, or PET, is commonly seen in disposable plastic bottles. PET is the ideal filament for any pieces intended for contact with food. Moreover, the material is fairly rigid and has good chemical resistance. To obtain the best results when printing with PET, print at between 75-90ºC. 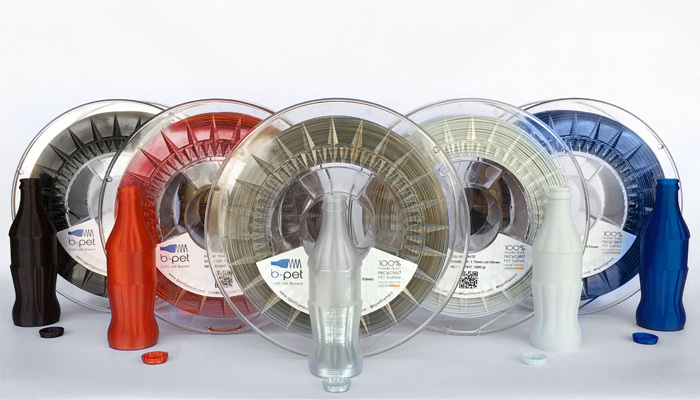 PET is commonly marketed as a translucent filament, with variants such as PETG, PETE, and PETT also sold. Advantages of PET include that the material doesn’t release any odours when printing, and is 100% recyclable. Different types of PET filaments. Polycarbonate (PC) is a high strength material designed for engineering applications. The material has good temperature resistance, able to resist any physical deformation until around 150ºC. However, PC is prone to absorbing moisture from the air, which can affect performance and printing resistance. Therefore, PC has to be stored in airtight containers. When 3D printing with PET, very high temperatures are required. If not done properly, separated layers may be visible due to a low temperature being used or if excessive cooling is allowed. There are polycarbonate filaments on the market that contain additives allowing the filament to be printed at lower temperatures however. A newer type of filament, and one of the most successful, are flexible filaments. They are similar to PLA, but usually made out of TPE or TPU. 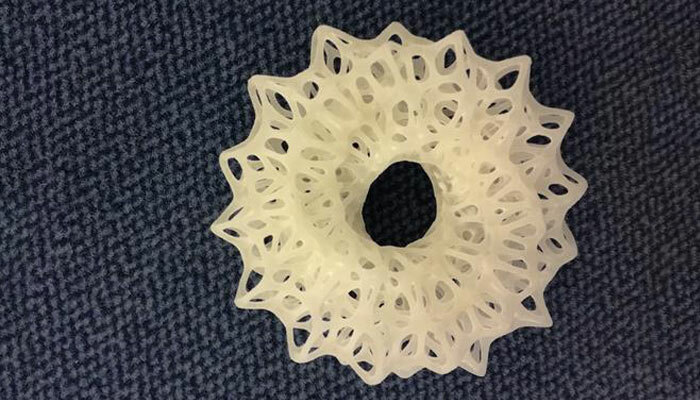 The advantage of using these filaments for 3D printing is they allow for the creation of deformable objects, widely used in the fashion industry such as in the Danit Peleg collection. Flexible materials are widely used in fashion and design. 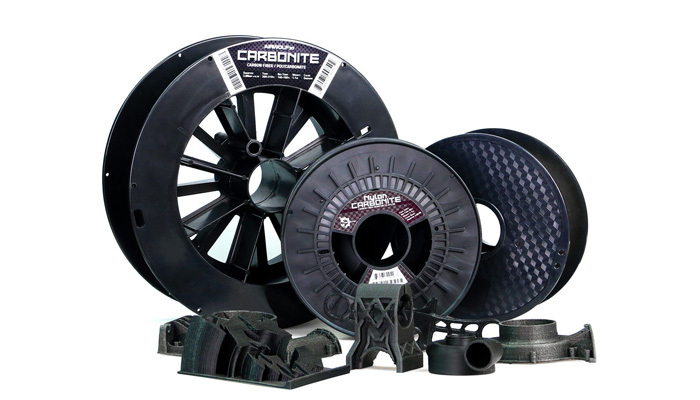 Filaments including carbon fibers have become increasingly popular in the industry, especially since Markforged 3D printers specialise in them. There’s a reason for its growing popularity: 3D printing with carbon fiber allows for very high strength whilst keeping manufactured parts very light. Carbon fibre filaments are actually small carbon fibers set inside a base material, which can be PLA, PETG, Nylon, ABS, or Polycarbonate, making them stronger. The print settings are usually the same as their base material, though a reliable 3D printer is required as carbon fibers can clog the print nozzle. Carbon fiber adds to the resistance of printed models. There are a variety of hybrid materials that mix base plastics such as PLA with powders to give them a new color or finish. These materials are usually 70% PLA and 30% hybrid material. Additionally, there are wood-based filaments which can range from bamboo, cork, wood dust, and more. 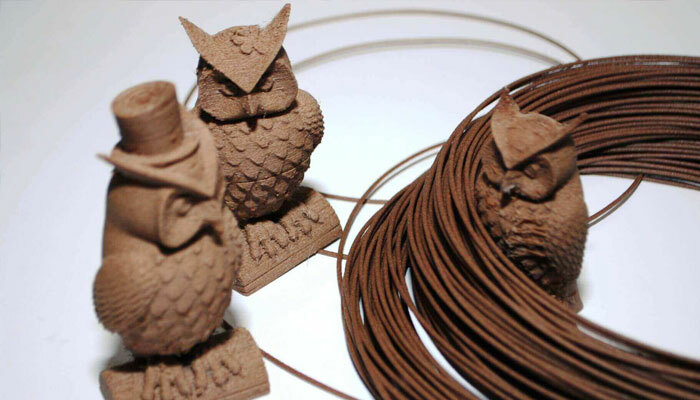 These materials mixed with the PLA give the hybrid filament a more organic texture. There are also a number of machines which use FDM-based technologies to print with metal, such as Desktop Metal’s 3D printers. 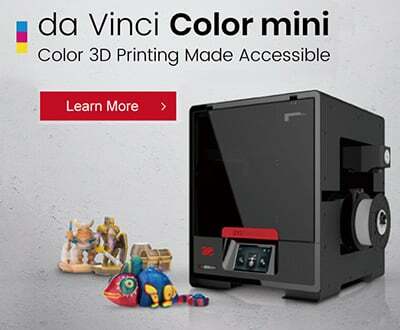 These printers however are not very accessible to most consumers, so ColorFabb launched their own metal 3D filament. Their filaments have the same base as their wood-based filaments, just with the wood parts exchanged for metal powders. This gives parts a classy metal finish, depending on which filament used used from options such as copper, bronze, silver, and more. Moreover, within the hybrid materials category there are also construction materials such as those used in houses. These include rocky materials such as cement, bricks, and sand. These give a completely different texture to models that they 3D print. 3D filaments based on wood. Soluble materials are materials printed with the intention of being dissolved in a future stage of the manufacturing process. 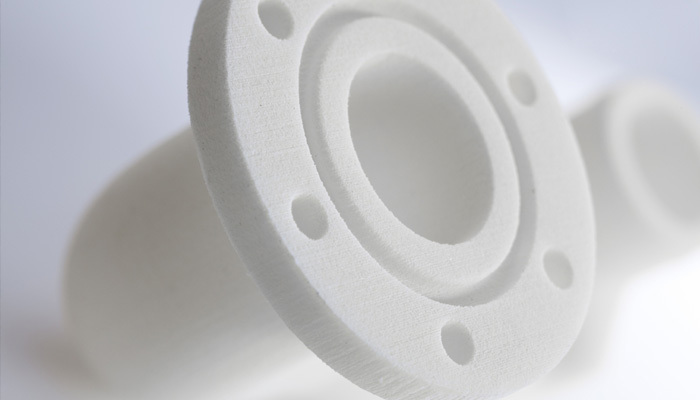 The two most common soluble filament materials are HIPS (High Impact Polystyrene) and PVA (Polyvinyl Acetate). HIPS is associated with ABS, and can be dissolved with limonene, whereas PVA is associated with PLA and can be dissolved using just water. There is also BVOH filaments which are becoming increasingly popular, especially in dual extruder printers. This is because the material is soluble in water, and according to experts has a higher solubility than PVA. Within technologies such as SLA, DLP, or even PolyJet, photosensitive liquid resins are used for manufacturing. These can be divided into two categories, thermoplastics and thermo-solids. 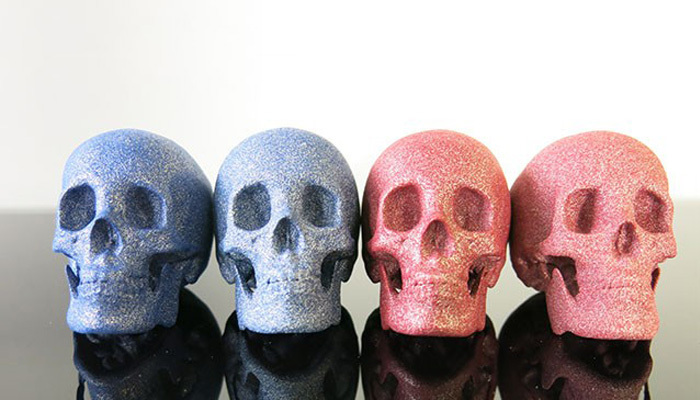 These resins allow for objects to be printed with either matte or glossy finishes. Photopolymer resins are 3D printed via a resin tank. The range of colors able to be used with resins is not wide, usually limited to white, back, transparent, and red. 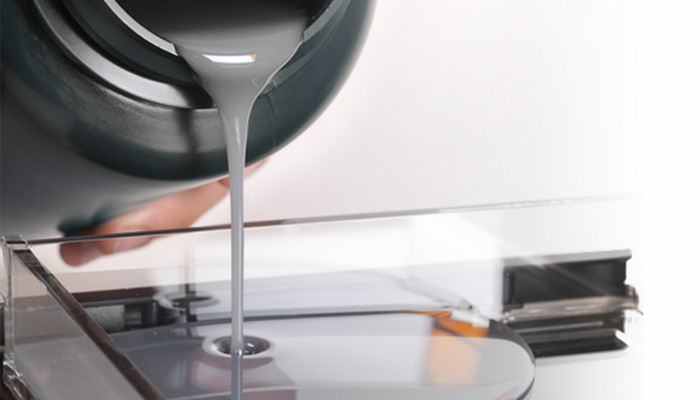 There are new developments however, such as Formlabs releasing a wider range of resins for their Form 2 SLA 3D printer. What differentiates resins from FDM filaments is that it is impossible to mix resins to obtain different results. Therefore, there are no dual extruder SLA printers. 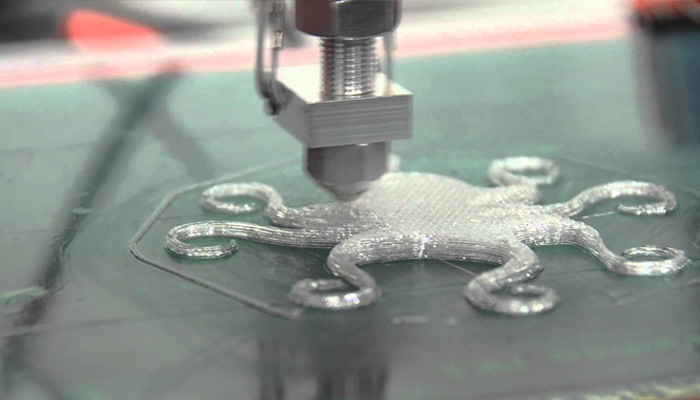 Additionally, when you use resins in 3D printing there is also a process of post-printing. This involves cleaning the models in isopropyl alcohol to strengthen the print. Within resin 3D printing there are some resins considered more technical such as flexible resins that offer greater flexibility and deformation in prints. Moreover, there are castable resins for 3D printing jewelry, and biocompatible resins focused on the dental sector and dental prostheses. 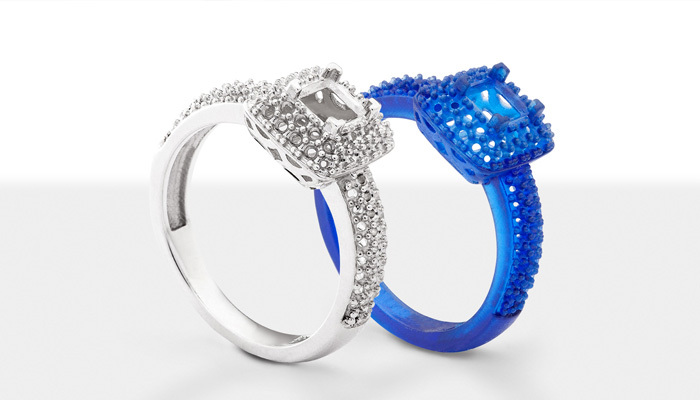 SLA resins have applications in industries such as jewelry. Selective Laser Sintering (SLS) technology uses plastic powders to manufacture pieces, by using a laser to fuse these powders layer-by-layer to create a finished model. Within these technologies there are different varieties of materials that allow manufactured objects to have different characteristics such as strength, flexibility, and texture. 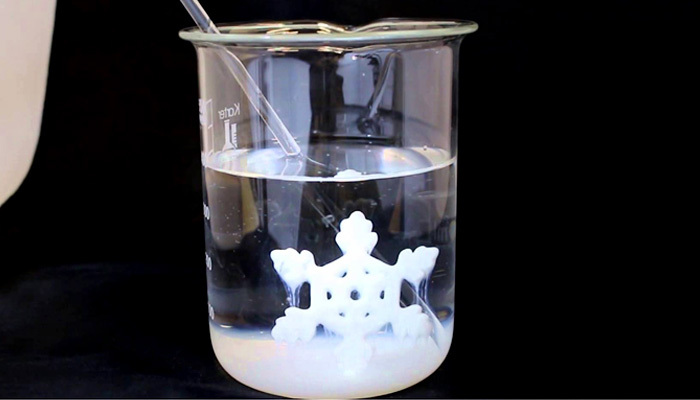 Objects made from polyamides are usually created from a fine, white, granular powder. There are however some variants of the material such as nylon that are also available in filaments used in fused deposition modeling (FDM). Due to its biocompatibility, polyamides can be used to create parts that come into contact with food (except foods that contain alcohol). Constituting of semicrystalline structures, polyamides have a good balance of chemical and mechanical characteristics to offer good stability, rigidity, flexibility, and shock resistance. These advantages mean that the material has many applications across sectors and offers a high level of detail. Due to its high quality, polyamides are used in the manufacture of gears, parts for the aerospace market, automotive market, robotics, medical prostheses, and injection molds. Alumide plastic objects are manufactured from a combination of polyamides and aluminium powder. The material has a large, slightly porous surface and a gritty, grainy appearance offering great strength and good temperature resistance (up to 172°C). However, some post-processing treatments are necessary, such as grinding, sanding, coating, or milling. Alumindes is used for complex models, design pieces, or for small series production of functional models that need high rigidity and an appearance similar to aluminium. This technique involves few geometric limits. 3D printing plastics such as alumide give a grainy texture to printed models. Polypropylene is another thermoplastic widely used in the automotive sector, disposable professional textiles sector, and in the manufacturing of hundreds of everyday objects. PP is known for its resistance to abrasion and its ability to absorb shocks, as well as relative rigidity and flexibility. However, drawbacks of the material include its low temperature resistance, and sensitivity to UV rays which can cause it to expand. Due to this, several manufacturers have developed alternative types of PP, simili-propilenos, that are stronger both physically and mechanically. What do you think of our explanation of each 3D printing plastic? Let us know in a comment below or on our Facebook and Twitter pages! Don’t forget to sign up for our free weekly Newsletter, with all the latest news in 3D printing delivered straight to your inbox!